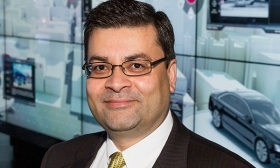 In the next decade, Audi will help disrupt the auto industry from the inside, says Anupam Malhotra, Audi of America's director of connected vehicles. Hot-button areas include connectivity, autonomous vehicles, electrification and digital retailing, Malhotra says. He says changing technologies will alter the way people think about and discuss the industry, and change what people inside and outside the business consider important. "Clearly, Audi sees the industry changing in many significant ways in the next 10 years," Malhotra told Automotive News in advance of a panel discussion Thursday at the 2017 CAR Management Briefing Seminars. "The total industry of transportation today is going to change. So how should we think about transportation in the future? "On the technology side, today you talk about fueling. Tomorrow it will be charging. Today it's range anxiety. Tomorrow it's range management." "The whole idea of transportation as something that you 'own,' or hold onto, and only use when you need it — as opposed to something that you have access to when you need it — that is going to have to change," Malhotra said. "Today, you look at driving-assist technologies as ways in which the vehicle can improve your ability to react in situations where you are still in full control," he said. "But in the future, these technologies that will prevent you from being a bad driver in the first place — prevent you from getting in situations with negative consequences." What seemed like advanced technology only a few years ago is already feasible and may be on the market, he said. In December 2016, Audi announced it was launching its so-called Traffic Light Information feature, which uses vehicle-to-infrastructure technology to let drivers know whether the next traffic light is red or green. If it's red, the display provides a countdown to when it turns green. The feature is working on certain 2017 models. It debuted in Las Vegas, where the traffic lights are equipped with compatible technology. Audi hopes to activate the feature in other U.S. markets soon. "That technology is out there today," Malhotra said. "This is something we are working at in more than 20 cities."